My name is Bella. I am a Pegasus and this is the story of how I met my secret friend, Maximillion. You know what a Pegasus is, right? NO? We are mythical creatures that look like horses with wings. We can fly, well, most of us can. Every day after school it starts. The other Pegasus don’t like me. You see I can’t fly, it scares me. Lots of things scare me. I am different and they just don’t like different. So I run, but it is hard to run faster than a Pegasus can fly. One day after school, I ran into the woods to the waterfalls. I hoped they would get tired of picking on me. They didn’t. They followed me and I was trapped. I closed my eyes in fear and waited, but this time was different. Shhh…don’t tell anyone but my secret friend came to my rescue! I can’t run faster than a Pegasus, but no one messes with a Dragon! My daughter asked me to write a book about a Dragon and a Pegasus who become Secret Friends. She was struggling at school with a bully, so I decided to add that to the plot of the book. My six and nine year old helped choose the characters. They both love Dragons and my daughter could not find a book that had a Pegasus and a Dragon in it, so I created one for her. “I will try, Max,” she says staring up at the night sky. 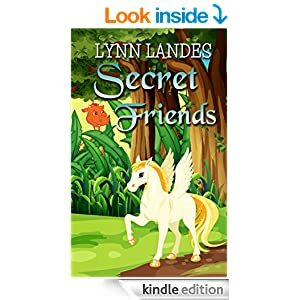 Lynn Landes is the author of multiple Christian fantasy books: The Angel’s Covenant, Covenant Breakers, Fae Queen and Shadow King. She started writing children’s books at the request of her children Makenna age 6 and Caleb age 9. Her stories are written to help children tackle the many obstacles they will face growing up. Hopefully they will make you laugh and bring a tear to your eye when you join Max and Bella on their adventures.